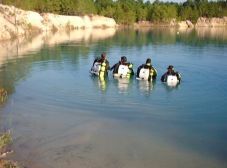 The Professional Scuba Association International’s (PSAI) Sport Re-breather Diver course is designed for those divers who wish to utilize either enriched air (Nitrox) in a Semi Closed Circuit Re-breather or oxygen concentrations up to and including 100% (+/- 1% by analysis) in a Closed Circuit Re-breather during their sport diving activities. The training and qualification depth is limited by the choice of equipment and in all cases to a maximum of 40 meters (135ft). This course and qualification does not include decompression diving. This PSAI course is designed to encompass many sport focused re-breathers in a generic format and is not a depth critical course. Depth qualification printed on the student certification is dictated by the student’s practical ability based on their recreational qualification, the chosen equipment and manufacturer’s guidelines for that equipment & the Instructor’s assessment of the student’s capability observed and discussed upon completion of the course.